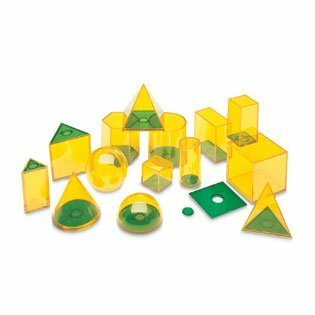 Demonstrate the relationship among shape, size and volume with this set of 14 clear plastic geometric shapes. Hollow size-related spheres, cones, cubes, rectangles, cylinders, pyramids and polyhedra have removable stoppers, allowing you to fill them with rice or sand. Includes Teaching Guide.